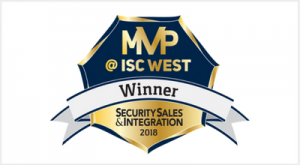 LAS VEGAS – April 11, 2018 – The Razberi CameraDefense™ cybersecurity solution has won the 2018 Security Sales & Integration (SSI) Most Valuable Product (MVP) Award for Video Surveillance. Honored during SSI’s SAMMY Awards gala held last evening during ISC West, CameraDefense enables integrators to automate and scale industry best practice cyber protections for networks, IP cameras, and other IoT devices. According to SSI, the mission of the awards program is to highlight how important products and technologies are to the success of security integration companies. A panel of experienced, independent integrators and industry consultants judged entrants based on product design, features, and benefits. Criteria included the ability of the device to help integrators attract new customers, design and install systems faster and thus more profitably, or gain a profitable margin on the equipment itself. Using Razberi CameraDefense, integrators can consistently implement and maintain automated cybersecurity protections for clients without needing additional firewall products and special expertise. Embedded in Razberi video surveillance appliances, CameraDefense is part of a secure architecture that hardens cameras automatically, isolates the camera network, and provides 24×7 cyber threat monitoring. Integrated CylancePROTECT® virus and malware software guard the video management system (VMS) by predicting known and unknown attacks to proactively prevent malware execution. CameraDefense can also be integrated with Razberi Core, a new product for data center recording that Razberi launched at ISC West yesterday. This solution gives organizations the option to centrally record heavier workloads while offering cybersecurity safeguards across the video surveillance system – from cameras to the server. For more information, visit Razberi in booth 9077 at ISC West.